Wethersfield, Conn. (August 12, 2013) –You may have missed this in history class: proto feminist Abigail Adams made huge profits while speculating in junk bonds during the Revolutionary War. At a time when married women weren’t allowed to own property, Abigail made a killing and left her family wealthy and debt free. Notably, this was during a period when many Revolutionary War figures were drowning in debt and financially ruined. 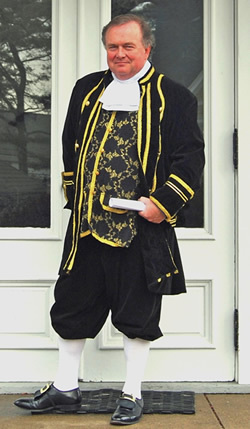 For the first time in Connecticut, Abigail Adams—savvy business woman, outspoken First Lady, and mother of the sixth American president, John Quincy Adams—will the remembered fondly by her greatest admirer, John Adams, the second president of the United States, as portrayed by the witty and engaging historical re-enactor, George Baker. The presentation, “My Wife Abigail Adams, America’s First Modern Woman,” will take place in the barn at the Webb-Deane-Stevens Museum, in Wethersfield, on Thursday, October 3, 2013, at 6:30 p.m. The free presentation will be preceded by a wine reception (by donation) at 6:00 p.m. Inspired by reading David McCullough’s biography, “John Adams,” Baker has been playing the role of John Adams since 2008. He is a graduate of Columbia University and Columbia Law School and is a practicing attorney in Connecticut.